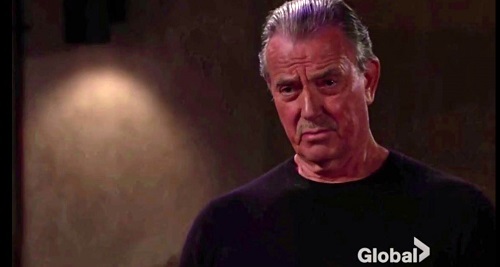 The Young and the Restless (Y&R) spoilers for Monday, September 18, tease that Victor (Eric Braeden) will confront Nick (Joshua Morrow) about his recent revelation. In Friday’s episode, Nick tells Faith (Alyvia Alyn Lind) that her grandfather forced them off the ranch. As a result, Faith no longer trusts Victor and that’s a real problem. On Monday, Victor will lash out at Nick for poisoning his grandchildren against him. Nick will argue that Victor is just spinning the story as usual. Y&R fans know that Victor influenced Faith’s perspective from the get-go. Nick couldn’t stand by and let the brainwashing continue. He’ll feel like Victor only has himself to blame. Victor will insist that this one’s on Nick. He’ll think it was wrong for Nick to reveal something he knew would outrage Faith. They’ll bicker about each other’s selfishness and what’s best for the kid. Meanwhile, Abby (Melissa Ordway) will suspect that a different battle is brewing. She’ll speak to Nikki (Melody Thomas Scott) and Jack (Peter Bergman) about her suspicions in Monday’s episode. The Young and the Restless spoilers say Abby will wonder what they think they’re doing. She’ll ask if Jack and Nikki are trying to start the final Abbott-Newman war. Abby will contend that their relationship is going to spell trouble. Victor may be ignoring their connection for now, but it’s only a matter of time until he takes action. Speaking of taking action, that’s exactly what Graham (Max Shippee) intends to do. After catching Ashley (Eileen Davidson) leaving his suite, Graham will suggest that she has 10 seconds to start talking. If she doesn’t come with a reasonable explanation for her break-in, Graham plans on calling the police. Fortunately, Ashley is a smart cookie. She’ll think fast and provide an excuse that she believes Graham will buy. Of course, this isn’t over. Ashley will definitely want to keep an eye on Graham, especially since her latest search proved he’s been lying. Graham will have some concerns about Ashley as well. It turns out he won’t be sold on her reason for sneaking in his room. Ashley and Graham will find themselves at odds as this storyline heats up. We’ll give you updates as other Young and the Restless news comes in. Stick with Y&R and don’t forget to check CDL often for the latest Young and the Restless spoilers, updates and news.